This setting is valid only when constant l 2-01 is set to 1. Set the power loss ride thru time in seconds. Note : the factory setting depends on the inverter,s capacity . it is the momentary power loss ride thru time when l 2-01 is set to be 1. 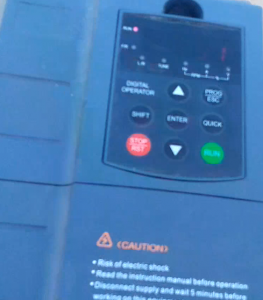 To set the time base block time in unit of seconds when the inverter restarts after momentary power loss. Note : the factory setting depend on inverter capacity this setting is used with the speed search and dc injection braking function. Set the time required for the leakage voltage to dissipate. Increase the setting if an over current (0 c) occurs when the speed search or dc injection braking function starts. This setting is valid for speed searches after a momentary power loss regular speed searches. Set the time allowed for the normal voltage to be restored after completion of the speed search . the unit is seconds . Note : this is the time in seconds for voltage to be restored from 0 v ac to 400 v ac after set speed researching is finished . this setting is valid for speed searches after a momentary power loss regular speed searches the voltage changes with energy saving control and voltage changes with base block clearing. Detection level of main circuit low voltage (main circuit dc voltage ) it is in unit of voltage. Note : setting range and the factory default is 400 volt to set normally it is not necessary to change the setting use this constant when you want to add an ac reactor and lower the main circuit under voltage detection level be sure to set a main circuit dc voltage value voltage that will detect a main circuit under voltage . Stall prevention selection during acceleration . To setting of acceleration prevention. 0: disabled (acceleration as set with a heavy load the motor may stall.). 1: enabled (acceleration stopped when l 3-02 level is exceed acceleration starts again when l 3 the current is returned). (some function are restricted depending on the control method.). when setting 1 (enabled) is selected acceleration is stopped if the motor current exceeds the acceleration stall prevention level , acceleration is started again when the current falls below this level . the acceleration time can be longer than the setting depending on the load . when setting 2 optimum acceleration is selected depending on the load . when setting 2 (optimum acceleration ) is selected acceleration is performed using the acceleration stall prevention level as a basis in this case the acceleration time is disregarded. the keb function restores the operating conditions for momentary power loss by applying a frequency deceleration to create inertia energy when a power loss occurs and thus avoid the power loss . setting range is 0.0~100.0 , factory setting is 0.0 and change during operation is x . 200 volt level 0.4~15 kw/400 volt level 0.4~18.5 kw. What i do not realize is actually how you’re not really much more well-liked than you may be now. You are so intelligent. You realize therefore significantly relating to this subject, produced me personally consider it from numerous varied angles. Its like men and women aren’t fascinated unless it’s one thing to do with Lady gaga! Your own stuffs excellent. Always maintain it up!